BEFORE: It’s finally the end of a very long work week and I can sit back and relax for the finale of Leone’s “Man with No Name” trilogy, probably the best known of the three films, The Good, the Bad, and the Ugly. AFTER: Apparently the blu-ray has the extended edition of the film instead of the theatrical release and I have a feeling many of my complaints would be assuaged if I had seen the shorter cut, but alas, that is not the case. Before getting into the complaint department though, lets start with the positives. As with A Fistful of Dollars, and to some extent For A Few Dollars More, Ennio Morricone’s score is fantastic. Especially with this film, the score is so iconic, that if you ask someone to play a Western tune, chances are it would be the theme to The Good, the Bad, and the Ugly. This film is also the highlight of Leone’s style, at least from these three films. Leone perfected what he began in A Fistful of Dollars with The Good, the Bad, and the Ugly; focusing the viewer’s attention. Especially in the face-off scene where the three main characters stare at each other for almost six minutes, Leone keeps the suspense and anticipation up by limiting the focus to certain parts of the scene. You either see the person’s face, or their hand by their guns; never both at the same time. By limiting what is in each frame, you are forced to think about where everyone is standing, how their guns are positioned, etc. The story is where most of my complaints lie. 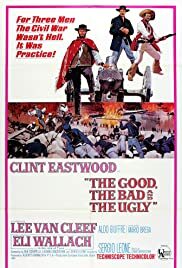 All three characters, The Good (Eastwood), The Bad (Lee Van Cleef), and The Ugly (Eli Wallach) are searching for a hidden cache of $200,000 in gold coins with alliances between the three formed and broken throughout the film. Again, a lot of this may be attributed to the extended edition, but it was just too long. There were many scenes which I felt did not progress the plot or the character development at all (many of which involve the Union army). Also, the Bad, who is introduced in the beginning by interrogating former soldiers for information about the gold, disappears for large chunks of the film. After his introduction scene, he doesn’t show up again until about halfway through. After more interrogation, he disappears again to show up once more for the final face-off. All-in-all, it was just another average film. Morricone’s score and Leone’s style really stood out and were the highlights in this trilogy, but the problems with the story leveled out the overall entertainment value. Looking at the trilogy as a whole, I’d say For A Few Dollars More had the best story, The Good, the Bad, and the Ugly was best visually and audibly, and A Fistful of Dollars was just very blah; nothing stood out positive or negative.